Bangkok’s Chinatown, or Yaowarat, definitely earns its spot on the list of must-see places in Thailand’s capital. It is home to one of the city’s most iconic streets and a haven for street food lovers. I have been to Bangkok many times before, but for some reason, I’ve never made it to Chinatown. That’s why it was sitting on the number one spot on my todo list for quite some time already. 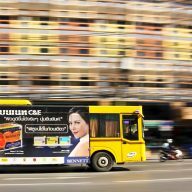 About a week before my latest trip to Bangkok, I got invited to try out TakeMeTour, a company that promises a different spin on something I usually dread: guided tours. The concept is simple: Instead of professional tour agencies, local guides offer tours around their neighbourhoods. While you will find a lot of the main attractions on their site, there are also some hidden gems for people like me who think they’ve seen it all. I am a very explorative person and have tried my best to avoid guided travel as much as I can. After a couple of years of living in Southeast Asia, I get around pretty easily after all. 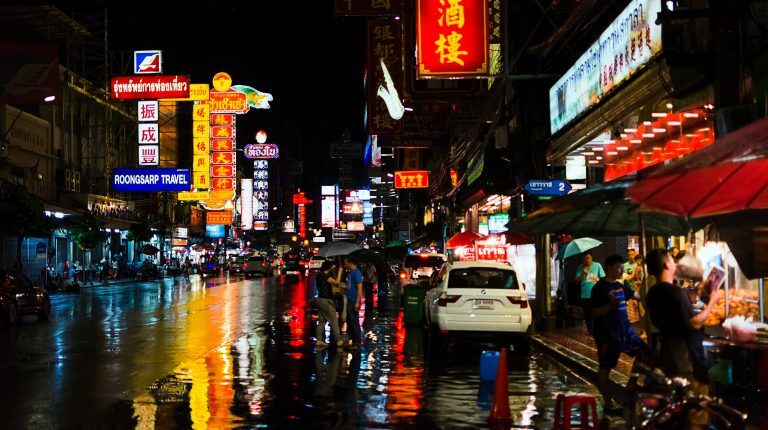 This time, however, I only had limited time to plan my trip, so I thought I’d give guided tours in Thailand one last try on a trip through Bangkok’s nightlife in Chinatown. Before we continue, a disclaimer: The tour was offered to me free of charge by TakeMeTour to try out their services, and because I liked it, I have since become an affiliate for them. This means that if you decide to book a tour with TakeMeTour through one of my links, I will get a small portion of the profits at no extra cost for you. I must admit, I prefer to take travelling slow and explore all the nooks and crannies of a place all by myself. I don’t usually care if I miss one of the main attractions, as long as I had a great time with lots of new impressions. However, I understand why guided tours exist and why some people prefer to travel with a guide rather than on their own. The biggest problem I always had with guided tours is that you never know what you’ll be getting. I don’t trust the glossy flyers in hotel or hostel lobbies and the sheer amount of them already stresses me out. Without doing a tonne of detective work, it’s really hard to find out which companies will deliver on their promises and which won’t. That’s why I liked the concept of a site like TakeMeTour from the get-go. It’s basically the Tripadvisor for guided tours. 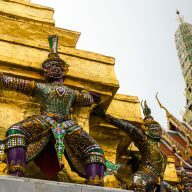 The site is beautifully designed and allows you to easily browse through multiple activities for different cities in Thailand. Every offer comes with a detailed description and a time table so you know exactly what you’re signing up for. Guides can also post photos from their tours and some seem to update their galleries quite frequently to show off their happy customers. The most important thing to me, however, is the review section. Although you should always take reviews with a grain of salt, they are a pretty good tool to determine if something is worth your money. I have said before that I got messaged by TakeMeTour but in fact, I have already stumbled upon them before, when researching some fringe market on the outskirts of Chiang Mai. 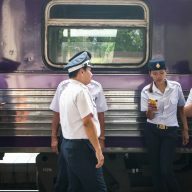 I have covered almost everything there is to do in Thailand’s rose of the North and finding new and interesting things have become a real tough one. So you can imagine how surprised I was to see some places I haven’t been to on a website for guided tours. That’s another great thing about TakeMeTour. 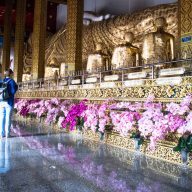 Of course, you will find all the usual suspects like floating markets or temples on their website but they also offer some hidden gems for the seasoned traveller. Personally, I would love it, if they’d focus even more on those off-the-beaten-path experiences which make them stand out from other tour providers. If you’ve found a tour that you like, you can easily book it on the site, connect with your guide and start exploring. We had a full day of activities in Bangkok planned. 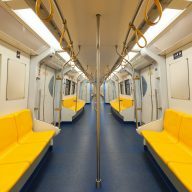 First, we would explore some items off of our to-do list on our own before meeting up at a BTS station with our guide Pinkie at 6 PM. During the day, she called, to remind us again where to meet her and how to get there. The sun was shining and everything seemed well until at 5:30 PM, when we left the BTS and all hell broke loose. Thailand’s weather can get really unpredictable during the rainy season. One moment you’re putting on sunscreen, the other you’re rushing to take out your best companion, the 7-11 poncho. The pouring rain in Thailand can be annoying but luckily it rarely lasts for too long. So when Pinkie arrived to meet us, the downpour had already slowed down and transformed into a mild sprinkle. We quickly moved over to the nearby pier for cover and to wait for our express boat to Chinatown. 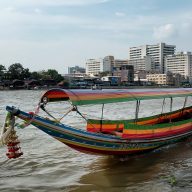 The heavy rain slowed down traffic on Bangkok’s Chao Phraya River, and we had some time to get to know each other better. About 10 minutes later, the boat arrived and a few stops later we started our journey through the soaked streets of Bangkok towards Yaowarat Rd. Christopher liked Pinky, too. We really had a great time! Pinkie started telling us why she likes Chinatown so much and why she chose to show people around this part of town. As a child she used to help out in her aunt’s business, doing small deliveries in the neighbourhood every day. She fell in love with the Chinese influences, especially the food, and has been coming to Yaowarat ever since to eat her favourite dishes and desserts. She sounded more and more like the perfect person to follow on a street food tour through Chinatown. A little red riding hood in the centre of Bangkok. When we finally arrived at Yaowarat Rd., I was stunned. It turns out that our little misfortune with the weather actually was a lucky coincidence. I have seen photos of the illuminated signs with Chinese writings at Yaowarat Rd. before but seeing it in person, especially with the reflections in the wet asphalt, made me think of scenes from Bladerunner. 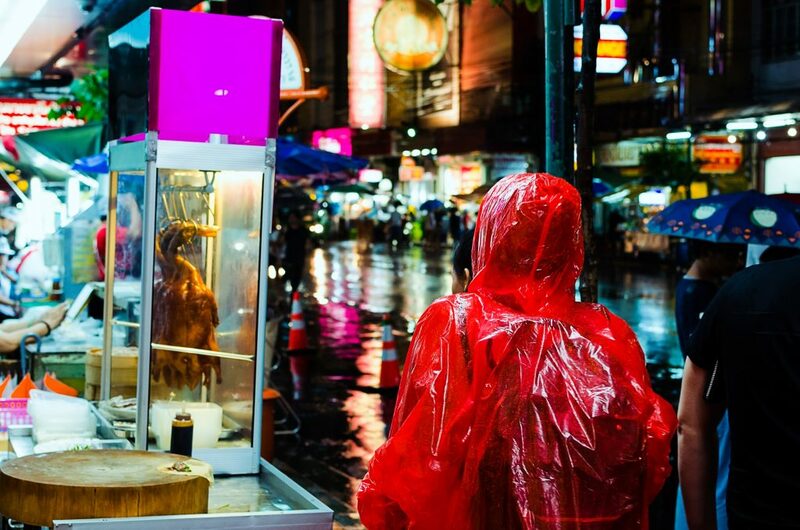 If you followed the news about Thailand lately, you might have heard that Bangkok’s government is trying to shut down street food stalls, especially in Chinatown. To our surprise, the streets were still somewhat lively, even after the rain. Pinkie showed us around and explained, that it’s really more about clearing up the sidewalks to reclaim space for pedestrians, than getting rid of street food. Most of the stalls that have been there for years are still there. The first food stall on our tour, for example, has been selling Pad Thai in Chinatown over generations for more than 60 years! I have eaten Pad Thai countless times before. It’s probably the most famous Thai dish of all time but its roots actually lie in China. While stuffing our faces, we talked about our best and worst Pad Thai experiences and how many people are surprised to find out that Pad Thai actually is not that popular in Thailand. After finishing my large portion, I was afraid I was not going to be able to eat more. 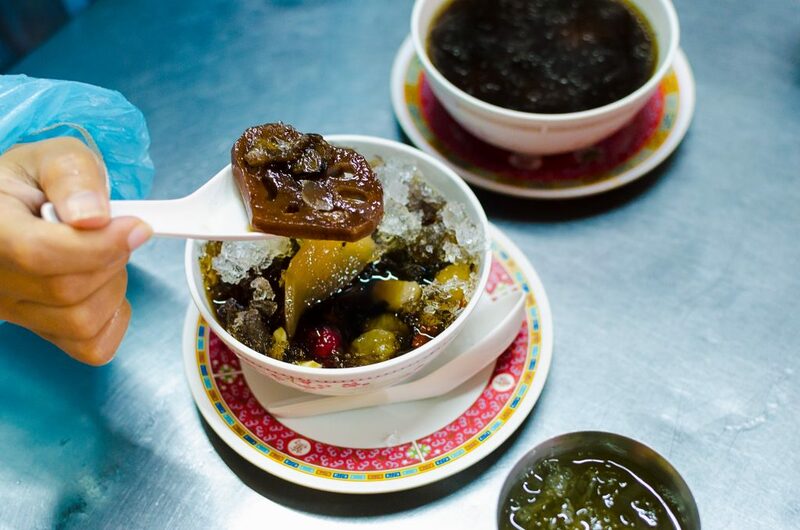 Dtao Tung is a delicious, cold desert that combines Thai and Chinese flavours. We continued our tour along the main road and stopped by a small, inconspicuous stand with Chinese signs. I love to try new things but especially when it comes to food, I am guilty of sticking with what I know. I often walk by most street stalls and only target specific restaurants or stalls, when I’m really hungry. At this stall, I had no idea what to expect, even though Pinkie teased some kind of dessert. I am not that keen on desserts in general and Thai ones in particular, but I was prepared to try it out. We sat down and Pinkie ordered two bowls filled with dark liquids. We inspected them suspiciously but Pinky soon explained each dish very thoroughly. The first one was called “bua loy nam khing”, a hot, gingery broth with a slightly sweet and tangy smell. It wasn’t spicy, or too bitter, or sour. It tasted like sweet ginger tea and it really warmed me up. Even though Thailand enjoys hot weather all year round, you sometimes need some comfort drink like that, especially when it rains. Hidden in the broth were soft and chewy dumplings, filled with black sesame. Even though I felt full after the Pad Thai, I suddenly felt like there was enough room for a truck load of those dumplings. The second dessert we were served was cold. The syrup was called “dtao tung” and was more sweet and fruity. It was filled with different herbs and seeds. There were chestnuts, dried fruits and even lotus flowers! I liked this one a little less, but still enjoyed it. We spent quite some time at the dessert stall with Pinkie. While sipping on iced, green tea, we chatted about Thai traditions, living in Bangkok, her family, or the recent craze when David Beckham showed up in Bangkok. This experience was a great reminder why it can be worth travelling with a guide, even if you are more experienced. It’s easy to miss out on delicious treats or hidden places, and having someone to show you around can open up a completely new perspective for you. Walking through the streets of Chinatown in Bangkok. There is food everywhere here! After finishing our drinks, we moved on to a stall that stood out a bit because it looked much fancier than the surrounding street food stalls. Behind a small table were two men dressed up in full maître de cuisine outfits. I knew we were in for a treat. Pinkie explained that they belonged to the Shanghai Mansion Hotel, which has a very nice and expensive restaurant. To attract customers they decided to also sell some of their foods down in the streets. We got a couple of spring rolls and I must say that they were the most delicious ones I had ever tasted. They were deep-fried, but didn’t have that hardness to them and inside there was the most succulent duck meat! Divine! Unfortunately, due to the rain, a couple of stalls we were going to visit during our tour were closed that day. We still had a tonne of fun with Pinkie and that made more than up for it. She was chatting and laughing the whole time and I really enjoyed our little tour through Chinatown. When it was time to say goodbye, I left with a tummy filled with delicious foods and a smile on my face. If you are someone who takes guided tours on their holidays, then I can definitely recommend checking out TakeMeTour. 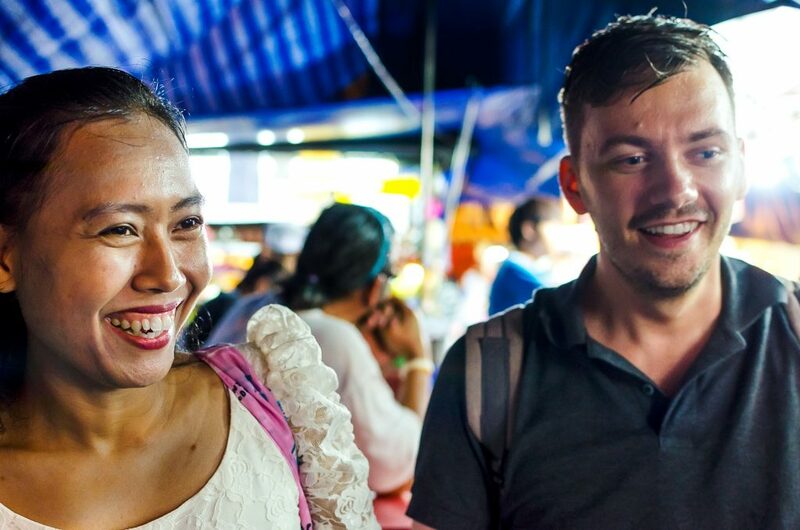 I lived in Thailand for more than two years and still had a good time with our local guide. 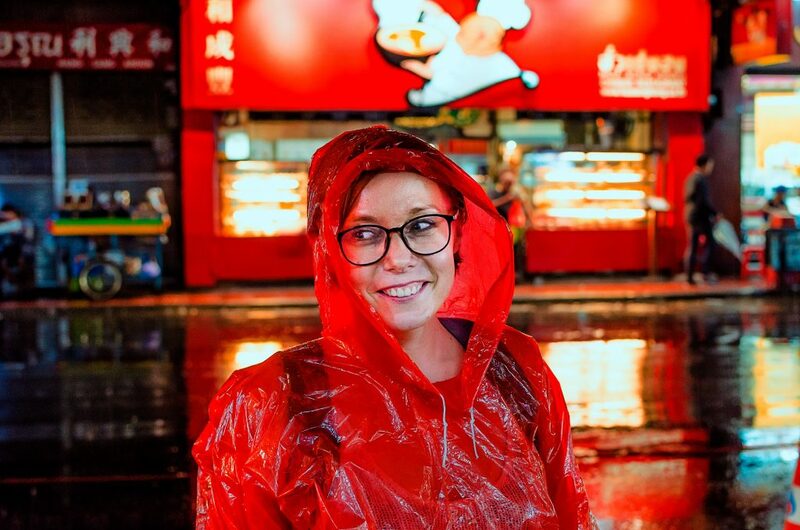 If you decide to book a Chinatown street food tour with Pinkie, then make sure to say hi from us!